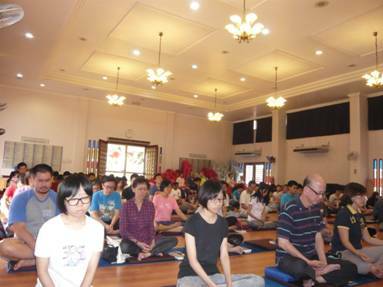 It was so beautiful to see so many devotees packed in SJBA Shrine Hall last Sunday, 3rd March 2013, in metta meditation led by Sayadaw U Rewata during our Morning Puja Service. 1) As another community service for our members and devotees with SJBA arranging with 2 experienced Chinese Physicians qualified in Traditional Chinese Medicine Treatment to give treatment to those with certain sicknesses and bodily ache/pain, every Saturday, 9am to 12pm, at SJBA. The fees are chargeable at RM30.00 which include the diagnosis, acupuncture or other treatment, and medicine. 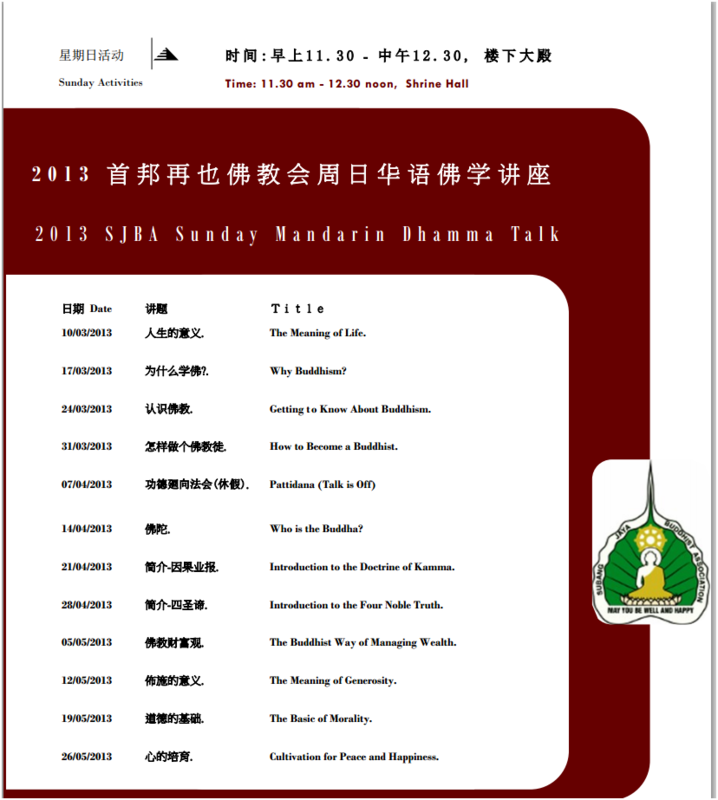 3) SJBA is starting a Puja Session conducted in Mandarin beginning 10th March 2013, 11.30am to 12.30pm at SJBA Shrine Hall. On 10th March, we shall have a Dhamma Talk by Sis Tan Yee Yong who was the former SJBA Youth Section Chairperson and Dhamma Department Head. She currently serves in SJBA Dhamma Subcommittee. Sis Yee Yong graduated with a Bachelor of Science, MBA, Diploma in Buddhism and a Master of Arts in Buddhist Studies (IBC). Please inform and invite your Chinese speaking relatives and friends. The gift of the Dhamma is the highest gift so give this gift of Dhamma to your relatives and friends. If you have old people who need transport to and back from SJBA, please call Sis Lily or Sis Cindy at 03-56348181. 4) This morning, Sayadaw U Rewata will lead us in chanting and meditation. Sayadaw U Rewata was born in 1955 in Thonse, Myanmar. He graduated in 1980 with Bachelor of Science at the Rangoon University. He was ordained in 1983. He followed Pariyatti and Patipatti under the guidance of Most Venerable Chanmyay Sayadaw U Janaka Bhivamsa. He has travelled widely to many countries like Japan, USA, Canada, India, etc for missionary work, teaching Metta Bhavana, Vipassana Bhavana, Suttanta Recitations, etc. 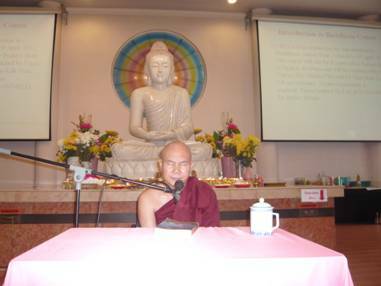 He served as the Abbot in Hmawbi, Yangon in 2004 to 2006, and also has been the Abbot of the Satipatthana Vipassana Association, Springfield, USA. Sayadaw U Rewata is currently in Subang Jaya Buddhist Association to support its Dhamma missionary work. 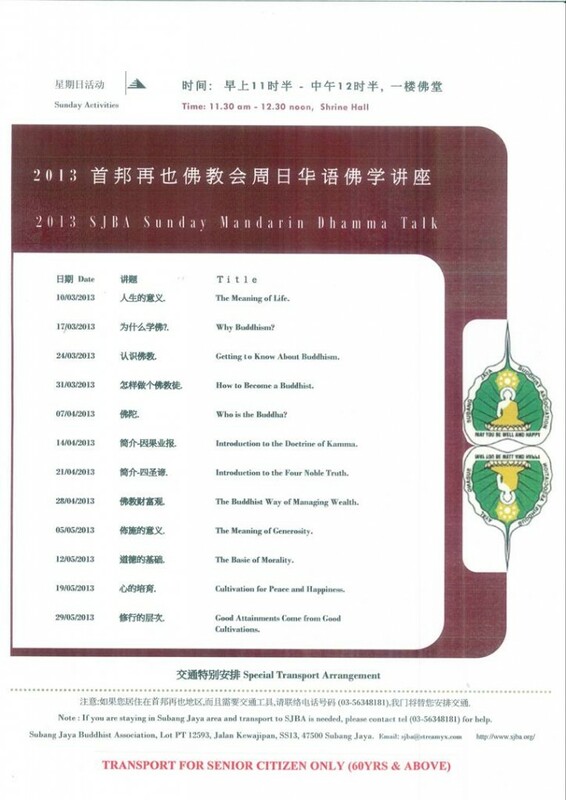 1) The Traditional Chinese Medicine Service in SJBA will resume this Saturday 23rd February. 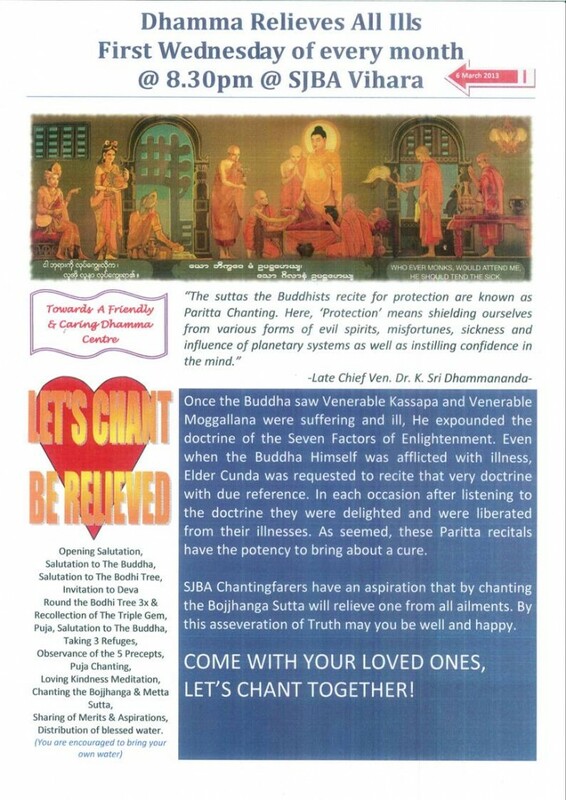 It is another community service for our members and devotees with SJBA arranging with 2 experienced Chinese Physicians qualified in Traditional Chinese Medicine Treatment to give treatment to those with certain sicknesses and bodily ache/pain, every Saturday, 9am to 12pm, at SJBA. 2) SJBA cordially invite all members and devotees, relatives and friends to join our “Gong Xi, Gong Xi” Potluck Dinner this Saturday 23rd February 2013 to celebrate the Chinese New Year together and promote fellowship as we enjoy the various program planned for the night together with about 40 guests from the Ci Hang Old Folks Home. The program include New Year Blessings at 7.00pm followed by, Dinner, Lion Dance, Fireworks Display, Performances by SJBA Choir, YS and Sing-along. All are welcome. You can also give angpows to the Old Folks to cheer them up.